A term “data scientist” was coined only a decade ago. Since then, the job of discovering trends and drawing conclusions from huge data sets has become one of the most sought-after professions across wide variety of industries. Data often comes in PDFs or their worse cousin, scanned PDF, so it needs to get unlocked and usually exported to spreadsheet programs like Microsoft Excel or CSV before one can run any sort of analysis on it. 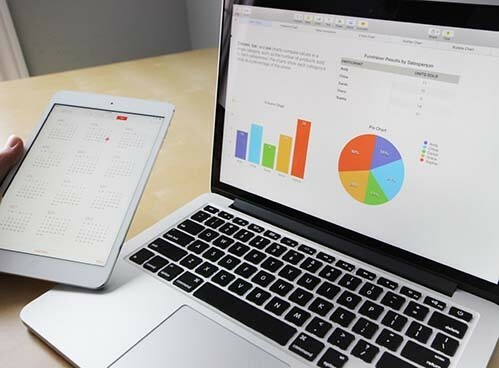 This leads us to a conclusion that a reliable PDF converter that allows its users to quickly and accurately convert native and scanned PDFs to Microsoft Excel or CSV is one of the key tools in every data analyst’s toolbox. PDF to Excel converters are widely available and come as desktop, web-based and even mobile solutions. Data analysts dealing with simple, clean and organized PDF tables can very often rely on free, usually online PDF tools such as Cometdocs for example, which is well known in the data journalism space. However, what if you are dealing with complex, messy and, even scanned (image) PDFs which are not easy to read and parse without the advanced OCR technology? Or if your PDF table needs some adjustments like replotting or deletion of some rows and columns? Most data analysts in such cases perform simple PDF data conversion to a spreadsheet and then spend hours on cleaning it to prepare for analysis and further manipulation. But, with the rise of data science, journalism and an ever increasing need to make sense of big data, software developers have recognized the need for more elegant and sophisticated ways to unlock data from PDF and export it in a clean and organized fashion into Excel or CSV for easy analysis. One such PDF solution is Able2Extract Professional 12 that specializes in PDF to Excel conversion. It comprises multiple features that allow users to quickly, securely, and accurately export PDF data into Excel and CSV, and even to adjust PDF tables before conversion and preview the output without leaving the software interface. Let’s take a quick look at what exactly it brings to the table when it comes to exporting PDF data into Excel (and CSV). Like some other PDF to Excel converters, Able2Extract comes with easy to use graphic interface that allows users to export PDF to Excel spreadsheets and CSV in just a few clicks. In this particular case, it is a no-brainer three step process: open, select and convert. Basically it comes down to specifying the part of the document to convert (be it a single PDF table on one page or a long multipage file with multiple tables and content) and clicking the easy recognizable Excel or CSV icon (as seen on a screen capture below). This is called the standard or automatic conversion. The data gets converted quickly and very accurately. With Able2Extract being the desktop solution, it goes without saying that your data is completely safe and secure all the time as it never leaves your computer. However, the real power and advantage of this software for big data users lies not in automatic conversion, but an advanced or custom conversion feature. This advanced feature allows users to set up table and row structure and preview the output before converting. So you get to control and adjust the output before conversion to Excel and thus save yourself the hassle of cleaning up spreadsheets after PDF data has been exported to Excel. 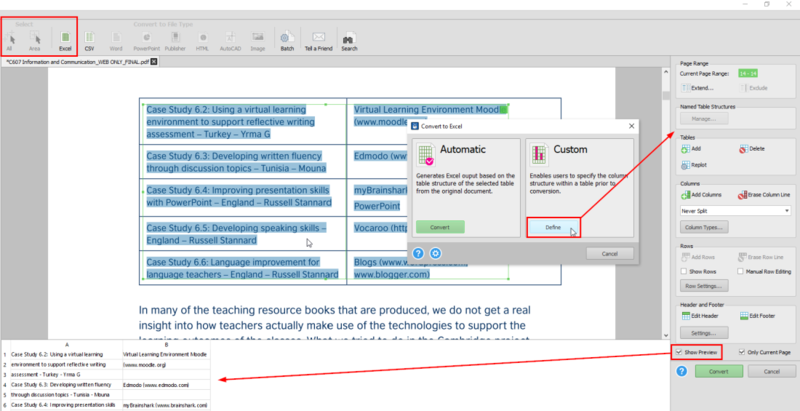 You can customize your PDF to Excel conversion using a myriad of options for setting up table structure and adjusting the look of your spreadsheet prior to conversion. These options you access by choosing the Custom PDF to Excel conversion as you can see below. From managing named table structures, rows, columns, headers, and footers, to adding, deleting, and replotting tables, you can adapt the Excel output almost beyond recognition (if that is what you would want, of course). You can preview your output after every customization to check if that is what you need. To save your custom PDF to Excel template for later reuse, go to File menu and click on the Save Custom Excel Template As, then choose the name and location for it on your drive. To load the template next you receive a file with the same layout, just go to the File menu after you’ve opened the file and selected an area for conversion, click on the Load Custom Excel Template and choose the template file you previously saved. As already mentioned above, Able2Extract integrates OCR technology which recognizes the characters from images (when you scan the hard copy of some archived document to PDF, it is basically an image representation of those characters which can only be recognized by OCR technology). This will allow you to extract data from scanned PDF tables and files and turn it into editable Excel spreadsheets or CSV. To wrap up the breakdown of useful Able2Extract features when it comes to handling PDF data and analyzing it in Excel or CSV, it is worth mentioning the program’s ability to convert multiple files at once using the batch feature easily accessible from the Command toolbar. One more area where Able2Extract can prove handy to anyone handling data is data collection. You can use it to create and edit PDF forms which are used for collecting data. If your main concern is simply exporting PDF data to Excel and CSV for further analysis, data collection may not be of interest, but it comes with the software, so it doesn’t hurt to be aware of it. Able2Extract Professional also converts PDF to about 10 more popular file formats, lets you create and secure PDF, edit and annotate PDF, and more. 6 of my favorite case studies in Data Science!